Scarce miniature map embracing the prevalent cartographic myths of the early 18th century. Does this map show the Madagascar pirate colony of Libertalia? An extremely scarce 1733 German miniature map of the world engraved by Georg Paul Busch. Presenting the world on a hemispherical projection, this map embraces many of the cartographic myths prevalent in the early 18th century. Tucked between the hemispheres are two diagrams of the solar system - the Tychonicum Systema, as delveoped by astronomer and alchemist Tycho Brahe and the Systema Copernicanum, as described by Nicolaus Copernicus. The map is surrounded by allegorical representation of the four elements. Baja California was subsequently discovered in 1533 by Fortun Ximenez, who had been sent to the area by Hernan Cortez. When Cortez himself traveled to Baja, he must have had Montalvo's novel in mind, for he immediately claimed the 'Island of California' for the Spanish King. By the late 16th and early 17th century ample evidence had been amassed, through explorations of the region by Francisco de Ulloa, Hernando de Alarcon and others, that California was in fact a peninsula. However, by this time other factors were in play. Francis Drake had sailed north and claimed 'New Albion' (identified here on the northwest coast of California Island) near modern day Washington or Vancouver for England. The Spanish thus needed to promote Cortez's claim on the 'Island of California' to preempt English claims on the western coast of North America. The significant influence of the Spanish crown on European cartographers caused a major resurgence of the Insular California theory. Just before this map was made Eusebio Kino, a Jesuit missionary, traveled overland from Mexico to California, proving conclusively the peninsularity of California. North of California a vast projection, labeled Terra Jedso, extends westward towards Asia , which it appears to join. Jedso was a term commonly used in the late 17th and 18th centuries to refer to Hokkaido or the unexplored lands north of Honshu. Wishful thinkers imagined that America may be connected to Asia and, presumed that, through the Pacific Northwest, a practical trade route to the wealthy market of Asia might be established. In the heart of North America the Great Lakes are amalgamated into a single vase body of water which itself is unlabeled. The British Colonies are limited to a coastal rang where is here identified s Virginia. North of California a vast projection, labeled Terra Jedso, extends westward towards Asia, which it appears to join. Jedso was a term commonly used in the late 17th and 18th centuries to refer to Hokkaido or the unexplored lands north of Honshu. In the Pacific, Van Diemen's Land is a near continent sized landmass presumable attached to Nova Hollandia (Australia) which peaks out form the southeastern quadrant of the Eastern Hemisphere. The Solomon Islands, following the discoveries of Pedro Fernandez de Quieros (1563?-1615) and Alvaro de Mendana (1542?–1595), are over large. The continent of Africa is presented according to common convention of the period. The Nile extends southwards from the Mediterranean in the Two-Lake Ptolemaic model. The Niger extends inland from the Atlantic where it mysteriously joins the Nile - a popular supposition. Just to the east of Madagascar an anchor identifies safe anchorage, the only such to appear on this map. This may indirectly reference the supposed pirate colony of Libertalia, a utopic anarchist republic founded by pirates. Libertalia is generally thought to be a myth, but around this time a pirate colony did exist in Eastern Madagascar on the island of Ille Sainte Marie, where modern explorers have discovered the shipwreck of Captain Kidd's lost ship, among many others. 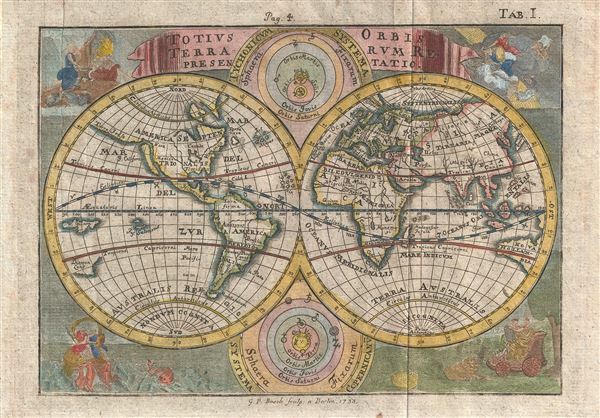 This map was engraved by Georg Paul Busch in 1733. This example was issued in Berlin for M. Benjamin Hederichs 1742 Historischen. Today this map is exceedingly scarce. Georg Paul Busch (???? - 1756) was a German engraver active in Berlin in the early 18th century. Busch primarily engraved portraits and landscape views. His corpus of maps is extremely limited. Busch is better known for his apprentice Georg Friedrich Schmidt, who surpassed the work of his teacher in all ways. Hederichs, M. B., Anleitung Zu den furnehmsten Historischen Wissenschaften…, (Berlin: Gottleib) 1742. Very good. Original fold lines. Platemark visible. Blank on verso.